The window looks to have closed on the double-digit annual price gains of the last couple of years. Our reading of the Core Commercial (CC) component of Moody's/RCA CPPI (that excludes multifamily and tracks sales transactions of investment-grade properties principally above $2.5 million) suggests a turn in market sentiment, as large cap CRE prices slipped for a third month in a row, off 0.6% in February and 1.8% since December. The last time the CC Index posted three consecutive months of negative returns was way back in January, 2010 just before the recovery got underway. We can point to the tumult in the debt markets in the months bracketing the New Year as a primary driver behind the setback in prices. But it's also conceivable that selected sectors of the investment market are correcting given astronomical prices for trophy assets and rock-bottom cap rates. Take, for instance, CBD Office, the perennial darling of institutional investors that outperformed all other commercial property types with a cumulative 95.8% gain over five years according to Moody's. It appears the tables have now turned for this sector, where prices notably declined by 1.7% in February and 5.2% over three months. A similar pattern has emerged for Industrial: i.e., a 48.8% cumulative return over five years, but losses of 0.9% and 2.7% for the most recent one- and three-month periods, respectively. Overall, the CC Index increased 7.3% over 12 months - not too shabby by most measures - but down precipitously from annualized price appreciation in the mid-teens as late as last summer. The nearby graph illustrates the strong pullback in price growth for large caps. 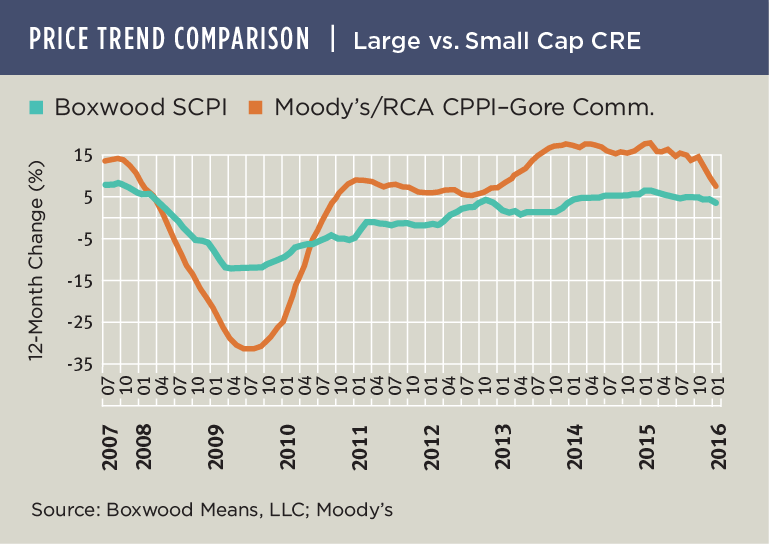 The graph also shows how price gains in small cap CRE, evidenced by Boxwood's Small Commercial Price Index (SCPI), significantly trail the performance of larger assets. SCPI price growth slowed to just 0.4% over three months and just 3.6% year over year in February - the lowest annualized gain since January, 2013. It's fairly safe to say that we've crossed a threshold into a period, temporary or otherwise, of normalizing property prices. It was ushered in by volatility and fear in the financial markets several months ago as crude oil dropped below $30 per barrel, high-yield bond markets deteriorated and the stock market swooned by 10%. Financial investors grew concerned about a stock market downturn or even recession and, seemingly on cue, many real estate investors headed for the sidelines. These are some of the proximate causes for the slowdown in CRE investment sales activity and prices. Yet psychology may be playing a role here, too. Many investors, particularly in the institutional domain, were wondering out loud for months about the sustainability of the CRE market's surge and whether prices had topped out after the extended, multi-year run. Those cautious views permeated the industry, and we might argue that those general sentiments or expectations became a self-fulfilling prophecy by dampening buyer zeal and ultimately bringing about the softer prices that investors were concerned about in the first place.